Durkin, a Chicago-based criminal defense attorney, spoke Monday at Notre Dame Law School about his career representing white supremacists, terrorists, and other persona non-grata. Durkin said people often ask him how he became the go-to lawyer for terrorism cases. Read more on the Notre Dame Law School web site. Mr. Durkin is featured in a December 14, 2016, article in the Wall Street Journal entitled, “A Terror Suspect’s Best Hope in Court”. Mr. Durkin is one of the winners of this year’s Stevens Award. The award is named after retired U.S. Supreme Court justice John Paul Stevens and was created in 2000 by Stevens’ former law clerks, the CBA and CBF. At the awards ceremony, Mr. Durkin and Joan Hall, a retired Jenner & Block partner — read aloud Stevens’ dissents from two cases — Rumsfeld v. Padilla, 542 U.S. 426 (2004), and Bush v. Gore, 531 U.S. 98 (2000). “In Rumsfeld v. Padilla, the high court was asked whether Jose Padilla, who was deemed an unlawful combatant by the Bush administration, had rights under habeas corpus. Click here to read the Chicago Daily Law Bulletin article on the award ceremony. 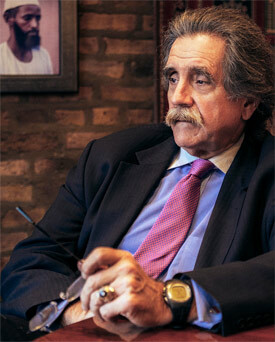 Mr. Durkin is featured in the Chicago Reader’s People Issue. In the interview, Mr. Durkin is quoted saying, “The war on drugs was a disaster for civil liberties in this country, and I think the war on terror has followed that template. War on anything in the criminal justice system is very dangerous, and it sends people into political postures that they shouldn’t otherwise be in. I’ve watched good judges emasculate the Fourth Amendment out of fear of looking soft. There’s virtually nothing left of the Fourth Amendment that I learned in law school. We’re creating a two-tiered system of justice in the federal court. We have one whole level of jurisprudence for regular cases and a separate level for terrorism cases. The fear I have is that sooner or later everything’s going to become national security. I don’t think it’s a stretch of the imagination for the president someday to issue an executive order saying that the commodities futures market is integral to national security because it goes to the heart of our banking system, and next thing you know a commodities fraud case is going to be a national security case.